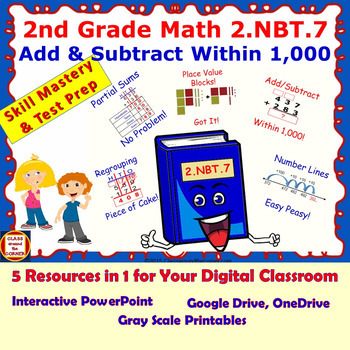 No Prep - 2.NBT.B.7 Add and Subtract within 1000 - follow Common Core and state standards and are formatted for Interactive PPT, Google Slides, Printables. All 2nd grade students learn differently. Which of these formats will help your students master the standard? This resource is guaranteed to grab their attention, ignite their motivation, and provide DEEP PRACTICE! Easy to use! No Prep! Free up your time! Format #1 is our bestselling WHOLE CLASS ENERGIZER: Interactive Math PowerPoint Task Cards and Test Prep in two sets. •	Interactive, animated PowerPoint designed for computer/doc camera and Smart Boards. •	40 Word Problems in two sets of 20 each to promote fluency, collaboration, and accountable talk. •	NOTE: This animated, interactive PowerPoint presentation usually involves the entire class. Kids also use it individually or in small groups with any device that has PowerPoint app installed. It ignites the enthusiasm, concentration, and interaction among the students. Learning automatically occurs as they “talk out loud about math”. •	This PowerPoint Tasks Cards resource is designed to show the animations in the Slide Show or Presentation View. Please follow the instructions on slide 2. •	Check the feedback on these interactive resources. IDEA: As you present the problems, students work on their mini whiteboards. Don’t ask them to raise their hands. Have them raise their whiteboards. Teachers are having GREAT RESULTS! Format #2 are designed for individual or small group use with PowerPoint or Google Slides. •	Same two sets of 20 problems each, designed in order of difficulty, following state and district standards. 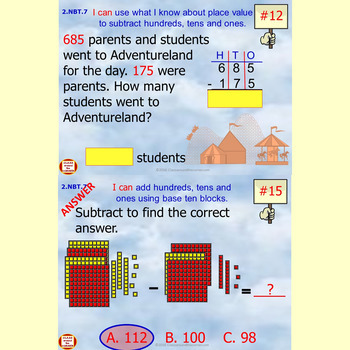 •	Each student uses their digital device to go through the questions but writes down the answer on paper. This fulfills the principle that math learning should involve every sensory system for reinforcement and skill mastery. •	At the end of each set is the answer key and I encourage the students to self-check their work and then turn the results into the teacher. •	NOTE: The visuals and illustrations will grab the students’ attention and focus, however, there are no animations active in either set due to the issues between PowerPoint and Google Slides. 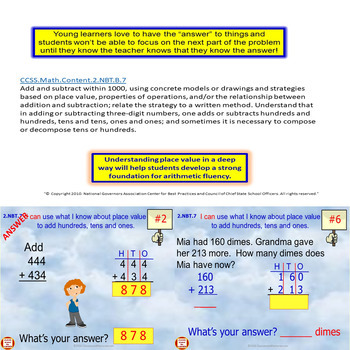 Format #3 are Math Printables. •	Same two sets of problems but in gray scale, printable files. •	Save your ink. No Prep, just print. •	Answer sheets included. These are perfect for take home, reinforcement of the standard, remedial attention, and for teachers who prefer printables to digital. The feedback from TpT teachers and my fellow teachers at school, who use these grade-level interactive sets of task cards, state that kids are engaged and enthused; that the students are focused on the screen, calculating the problems, helping one another with the answers, laughing at the images and animations, and most of all – TALKING OUT LOUD ABOUT MATH. We call it the “WOW” factor! Copyright © Classaroundthecorner.com. All rights reserved by author. This product is to be used by the original purchaser only. Copying for more than one teacher and her/his classroom is prohibited. This product may not be distributed or displayed digitally for public view. Failure to comply is a copyright infringement and a violation of the Digital Millennium Copyright Act (DMCA). Clipart and elements found in this PPT are copyrighted and cannot be extracted and used outside of this file without permission or license. Intended for classroom and personal use ONLY. See product file for clip art and font credits. We want you to be satisfied with our products and we make sure we do everything in our power to provide you with quality resources. Any issues, suggestions, questions please email: Classaroundthecorner@gmail.com. Thank you so much for shopping with us.